Vernal pools or "spring pools" are shallow depressions that usually contain water for only part of the year. They are often associated with forested wetlands. Why are vernal pools important? The vernal pools serve as essential breeding habitat for certain species of wildlife, including salamanders and frogs (amphibians). Juvenile and adult amphibians associated with vernal pools provide an important food source for small carnivores as well as large game species. In Maine, species that must have access to vernal pools in order to survive and reproduce include wood frogs, spotted and blue-spotted salamanders (two types of mole salamanders) and fairy shrimp. Avoiding impacts to significant vernal pools and their surrounding habitat is important because many amphibian species are pool specific: they must return to the pond in which they were born to breed. The loss of vernal pools and the critical terrestrial habitat around them leads to local loss of amphibian species, a decrease in biodiversity, and a decline in food available for many other animals that live in these areas. 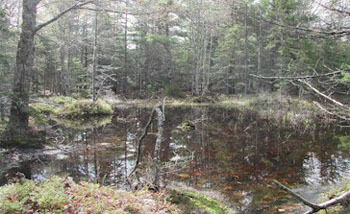 In Maine, vernal pools with high value for wildlife are called significant vernal pools . Are all vernal pools considered significant? Not all vernal pool habitats are considered "significant". In general, a vernal pool habitat is significant if it has a high habitat value, either because (1) a state-listed threatened or endangered species, such as a spotted turtle, or a rare species, such as a ribbon snake, uses it to complete a critical part of its life history, or (2) there is a notable abundance of specific wildlife, such as blue spotted salamander, wood frog, or fairy shrimp. I have a vernal pool on my property. How do I know if it is "significant"? The DEP may provide a written determination concerning whether or not a vernal pool habitat is significant. Are significant vernal pools protected? "Significant vernal pool habitat" includes the vernal pool itself and the area within a 250 foot radius of the spring or fall high water mark of the pool, which is considered critical terrestrial habitat. Starting September 1, 2007, significant vernal pool habitat is protected by law under the Natural Resources Protection Act (NRPA). An activity in, on, or over these areas must avoid unreasonable impacts on the significant vernal pool habitat and obtain approval from the DEP, through a Permit by Rule or individual NRPA approval. What happens if I have a significant vernal pool on my property and need a permit for my project? A permit by rule will be available if certain standards are met, and can be approved within 14 days. The standards do not create a mandatory setback or no-build zone, but do affect what can be done, so it is advisable to plan ahead. For more information on the NRPA, a copy of the rules addressing significant vernal pools, application forms, and related materials, see the NRPA page. What are the standards I have to meet to get a Permit by Rule? No disturbance within the vernal pool depression. Maintain a minimum of 75% of the critical terrestrial habitat as unfragmented forest with at least a partly-closed canopy of overstory trees to provide shade, deep litter and woody debris. Maintain or restore forest corridors connecting wetlands and significant vernal pools. Maintain native understory vegetation and downed woody debris. If the Permit by Rule standards cannot be met, the applicant may apply for an individual NRPA permit. Does it help if I want to restore some of the land that was previously developed? If more than 25% of the critical terrestrial habitat has been previously developed, restoring a portion of the developed area through supplemental planting or regrowth of native forest plants and trees may be considered toward meeting these standards. "Developed area" includes disturbed areas, excluding areas that are returned to a condition with the same drainage patterns and the same or improved cover type that existed prior to the disturbance. I have questions, need hard copies of materials, or would like to request a field determination. Contact your nearest DEP regional office, and ask to speak to the "on-call" person in the Land & Water Bureau, Division of Land Resource Regulation. Central ME Regional Office, 17 State House Station, Augusta, ME 04333-0017; Phone: 207-287-7688 or 1-800-452-1942. Eastern ME Regional Office, 106 Hogan Road, Bangor, ME 04401; Phone: 207-941-4570 or 1-888-769-1137. Northern ME Regional Office, 1235 Central Drive, Skyway Park; Presque Isle, ME 04769; Phone: 207-764-0477 or 1-888-769-1053. Southern ME Regional Office, 312 Canco Road, Portland, ME 04103; Phone: 207-822-6300 or 1-888-769-1036.